The history of Rajasthan dates back to the era of Harrapan Civilization. Several rulers came and went and each of them contributed something or the other in the development of the state. Portraying the true picture of Unity In Diversity, Rajasthan is a perfect combination of ethnicity, culture, religion,traditions, rituals and cuisine. All the major religions of India are followed by the people here: Hindu, Islam, Sikhism, Jainism and Christianity. The land of great Rajasthan is inhabited by several castes and sub castes. The major portion of the population belongs to the Rajput clan. Rajasthan is popularly known as the 'Land Of Rajputs'. The literal meaning of which is 'son of the king'. It is said that Rajputs were of Scythian origin who were originally the residents of Iran and Caucasia in central Europe. They later occupied the south of the Himalayas. The Rajput clan is categorized into the following: Sisodias, Rathors, Chauhans, Kachawahas, Bhattis, Panwars and Solankis. The caste system of Rajasthan can simply be divided into four categories: Brahmins, Ksatriyas, Vaishya and the Shudras. The writers and chroniclers of Rajasthan fall under the following eight categories: Kayasthas, Khatris, Orwals, Mohnots, Bhandaris, Singhis, Lodhas and Mohatas. The people belonging to these divisions mainly deal in business and administration. The interesting and entertaining Dholi, Dhadhi, Hinjara, Jagri-Patur, Bhagtan, Kalawat and Bhand communities of the state fall under the title 'Minstrels and Instrument Players' group. Bhils, Minas, Lohars, Garasias and Sahariyas are the major tribes of Rajasthan comprising around 12% of the total population. The Bhils are mainly found in Udaipur. The Minas are the inhabitants of the districts of Jaipur, Madhopur and Udaipur. Garasias and Sahrias tribes belong to the Sirohi and Kota district. The lohars are nomads who found their home in Udaipur. 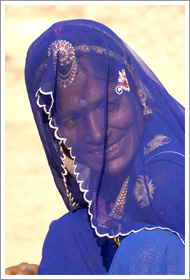 The Sahariyas inhabit in the jungles of Shahbad, Jhalawar, Sawai Madhopur, Dungarpur and Udaipur.